As a web editor you are responsible for one of the most important points of contact to your clients: your website. Visitors have high expectations to the user experience of your website and they don’t easily forgive you for major mistakes – neither does your Head of Communications! He or she wants your organization’s messaging to be consistent and professional and relies on you for ensuring your website meets these requirements. Here are some best practices related to web editing issues your boss would raise. If you have documents available for download on your website, you want to make sure they look the way they were intended to, when viewed by visitors. The safest solution is to make sure that all downloadable documents are in Portable Document Format (PDF). PDFs will look and print the same on all computers whereas other documents may not. Further, there are different software requirements for reading different file types, but PDF is a universally accepted type. In your content map or media library, locate all documents intended for download on your website and make sure their file types are PDF. Update and replace if needed. For the best user experience, make sure that your styling across the website is consistent. Uses of formatting, like bold and italic, that are part of your visual identity should be formulated in your CSS (the style sheets that determine the look across your site). Any deviations from the CSS should be located, reviewed and possibly edited. Scan your website for HTML related to formatting not formulated in the CSS, and review if the formatting supports or hinders your communication. Smaller size and lower resolution images will usually do the job just fine in conveying your message, whereas images of several megabytes can significantly worsen the loading time of your pages, and hence the user experience. In your content map or media library, locate all images on your site and make sure their size is less than 1 MB. Resize and replace if needed. 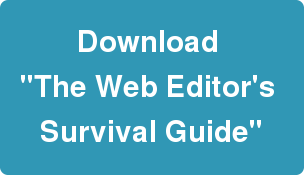 For more advice on how to survive in the website wilderness, download the full version of "The Web Editor's Survival Guide."